Fog is a complex atmospheric phenomenon. It is a visible mass consisting of cloud water droplets or ice crystals suspended in the air at or near the Earth’s surface. Nothing can be seen on a heavily foggy day. It could be so dangerous that the weather center is observing how long distance we can see things clearly in fog. 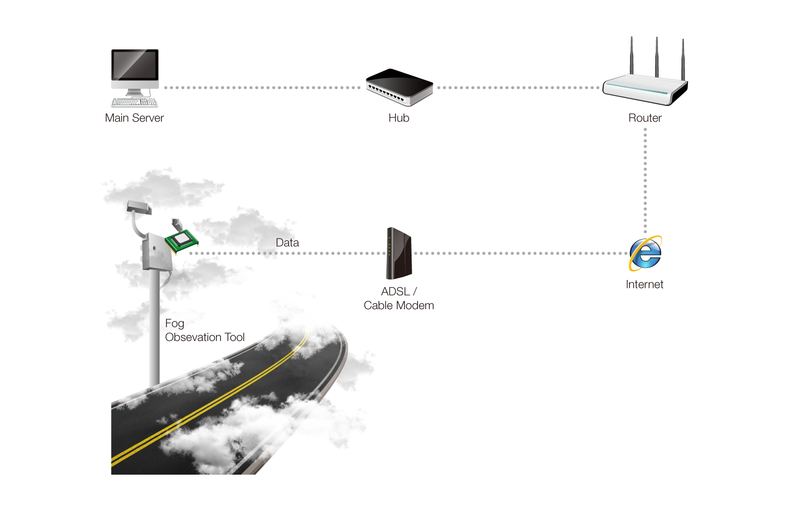 Sollae Systems' serial to Ethernet device server can be applied to fog observation system. In the weather center, the fog observation system is necessary along with its equipment. One of their equipment is visibility meter, which measures a distance how far the vision is clear. Our serial to Ethernet device server gets serial data from the equipment, and sends it to the main server by wire/wireless LAN. Especially when you use serial to wireless device server, it is very convenient to monitor fog condition from a remote site. It also makes a link to various information about visibility meter. You can always monitor remotely by adding network function to the serial communication of visibility meter.